What do you get when you mix a Mama in her polka-dot bathrobe, with a cup of coffee, a 22-quart stockpot, and a counter full of ingredients? Hamburger soup, of course! I share a ton of slow cooker meals on here, along with lots and lots of large family freezer meals. But there are times when the freezer and pantry are getting empty and this mega-sized crew of mine still has to eat! Those are the times when I love to pull out my ginormous stock pot and make up a huge batch of soup to get us through a weekend…or at least until I can do another large family grocery haul. This soup comes together fairly quickly and it’s so super easy to make. You can literally use whatever you have on hand; no need to go out and buy the exact ingredients I use in this video. That’s what makes it so great! Scrounge in your cabinets, pantry, and fridge and gather up what you have available to throw into this yummy soup. Hamburger soup typically calls for things like corn, beans, potatoes, cabbage, carrots, and celery. But because I was actually out of potatoes, carrots, cabbage, and celery, I went through my pantry to see what I had to work with. I came up with kidney beans, beef broth, corn, and some mixed veggies from the freezer. I also like to add uncooked brown rice to my soup to make it bulkier. More bulk means tummies stay fuller longer! Hearty and delicious; perfect for the fall and winter! Brown ground beef with chopped onions. In a large stockpot, (I use a 22-quart pot) dump all of your canned goods and frozen peas and carrots. Add in the browned hamburger and onion. Cook on medium-low for several hours, stirring occasionally and adding water as needed. Sprinkle shredded cheddar cheese on top of each bowl when serving. As you can see, I have no problem nearly overflowing any size pot you give me to work with. I did manage to get all 5 lbs of ground beef in there without it overflowing, but it was close. Cooking this soup on medium-low for several hours is the key to a delicious soup that doesn’t just taste like 20 cans of food in a pot. The longer it cooks, the better it tastes. Just give it a stir every now and again to keep it from sticking to the bottom of the pot. As the soup cooks down, and after you taste a bowl or two (haha), you can add water as needed to get it to the consistency you like. I usually serve this with a simple side like applesauce. Cornbread is excellent with it, of course! We will eat on this pot of soup all weekend…or until it’s all gone. Be sure to let us all know in the comments how you make your hamburger soup and what you serve it with! 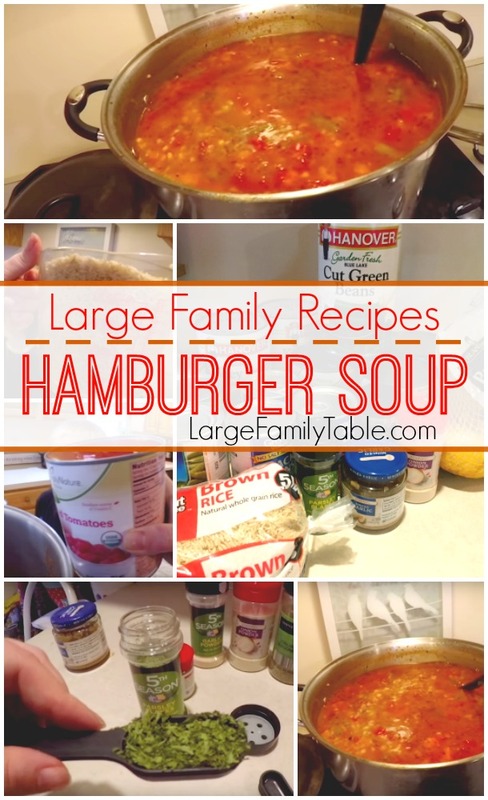 Click here to watch the full Hamburger Soup | Large Family Recipes on YouTube! I remember my mother making a similar soup when I was younger. But she always added potatoes to it. Instead of rice or noodles.